I know, I know, I’m Cultural Wednesday and museums are there for the culture. This week the CW family has taken advantage of an inset day and hightailed off to Paris. 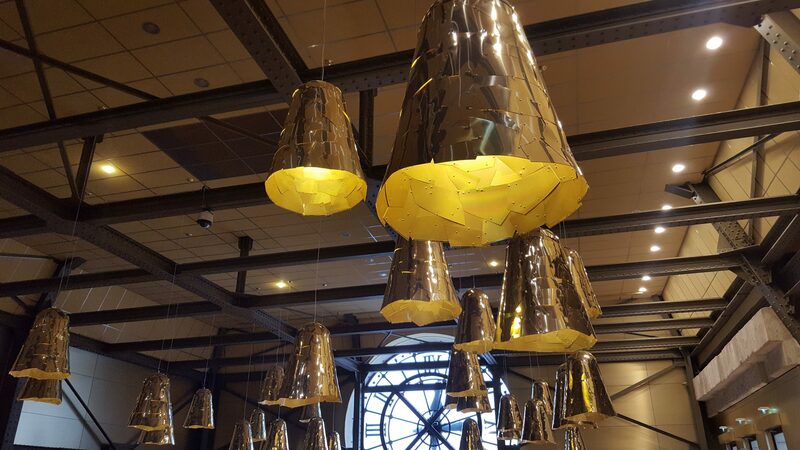 We headed straight for the Musee d’Orsay and very fine it is too, but we were also struck by the beauty of the eating spaces. So lovely, are the Musee d’Orsay restaurants that they deserve their own post. The restaurant uses the dining room of a railway hotel from back when it was a train station. Not only is the room beautiful, the use of modern colourful chairs makes the whole space rather jolly. Further on is the Cafe Campana, so named because a pair of Brazilian brothers by the name of Campana designed the space. The huge clock face is actually part of the original building facade but the brothers have come up with enormous gold lampshades to create an art noveau feel to the whole space. 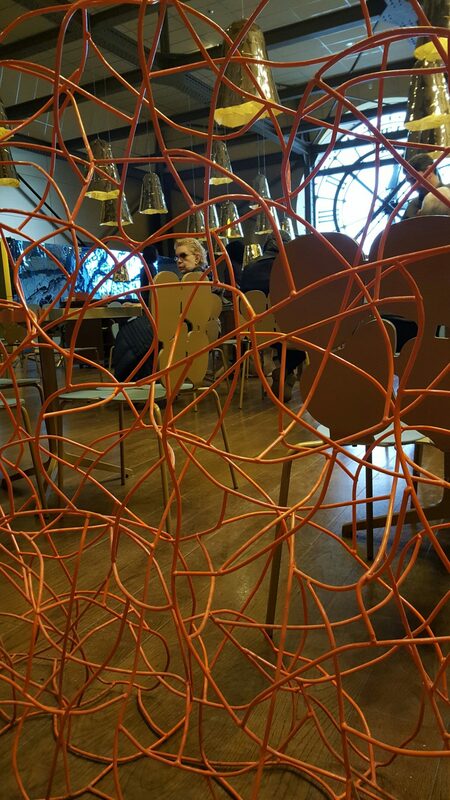 Those of us not eating were held at bay by a screen made of orange wire. Down on the ground floor is the more workmanlike Cafe de l’ours named after the enormous polar bear statue that stands next to the cafe. Still chic but not as fancy! The first two places offer a more expensive and time consuming option than our grab and go approach to lunch on days out, so it was a ham and cheese baguette next to the polar bear for us. Maybe next time Mr CW might treat me to lunch (or even dinner on a Thursday night) in the restaurant, after all, the room is a national monument and that makes it cultural! We did see more than just cafes, take a look at our Musee d’Orsay photo tour. Hi Catherine, the restaurant at the Musee d’Orsay does look proper posh. The chairs add an interesting touch. We would also opt for a baguette beside the polar bear, but it is always nice to get a glimpse into posh lunchtime dining. I’ve not been there in forever. Love your take on the restaurants and the things that catch your eye. This looks like a really interesting place to eat. I love the sculptures – it certainly gives people a talking point. Culture of the highest order! One of the benefits if identical twins is that go to the same school and have the same holidays! Still trying to plot an escape with Mr CW to eat in the first one!